Providence Resources’ boss said today that farm-out deals had helped the Irish explorer “shore up” its finances and bring first oil from the Barryroe discovery closer. Providence has inked four farm-out agreements in the last 15 months – two with Total, one with Cairn Energy, and another with Chinese firm Apec. The latter deal, announced in March, will give Apec 50% of the Celtic Sea licence containing Barryroe, with Providence’s stake dropping to 40% from 80%. Last year, Total struck a deal to buy 35% of the licence containing the Diablo asset, and 50% of Avalon. Cairn swooped for 30% of Diablo. Providence chief executive Tony O’Reilly said 2017 was a year marked by multiple commercial deals. But the Dublin-headquartered firm suffered drilling disappointment with the Druid and Drombeg targets, both of which are in the same licence area as Diablo – FEL 2/14. Providence said that despite the let-down, the data obtained from the wells would be useful when it comes to drilling the deeper Diablo structure. Speaking after the Dublin-based firm published its full-year 2017 figures, which showed pre-tax losses of £18million, Mr O’Reilly said Barryroe was Providence’s most promising discovery. Hydrocarbons have been logged in all six wells drilled on the structure, which is thought to be capable of yielding 350million barrels of oil. Mr O’Reilly said Apec was a partner that could take Barryroe through appraisal and into production. He said Apec would be able to make use of China’s huge inventory of underused equipment and rigs. Mr O’Reilly said: “Ireland is very attractive. 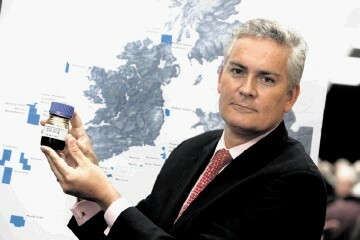 We were a lone voice for many years, but the oil industry is suddenly looking at Ireland again. “We’ve had a lot of activity and our team has done well to assess opportunities and bring in partners.